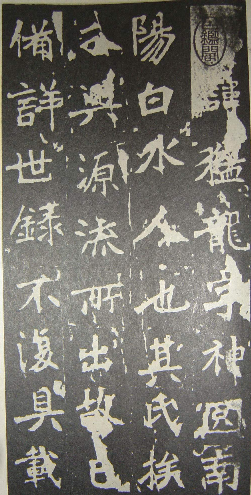 Northern Dynasty's stone tablet was erected in 522 AD. It is the Wei Lu Prefecture Governor and school founder Zhang Menglong's great achievement award tablet. This ushers in the later Tang Dynasty's calligraphy style. It is now stored in Shangdong Province, Qufu's Confucius Temple. It says Prefecture Governor Zhang Menglong is from Nanyang, White River. Number 1 tablet that is the pride of entire Northern dynasty is about Zhang Menglong, who is from my father's hometown, Nanyang, Henan province. Northern Dynasty was an era that is in denial by Chinese history. Rather, we emphasize on Nanjing being the Southern Dynasty's Liu Soong, Qi, Liang, Chen, and Southern Dynasty capital. The Northern Dynasty race is not Han; it is of Xian Bei, or mixed interracial marriage by Han and Xian Bei. When I was in grade school, there were many ancient books on my father's desk. I didn't know the significance of them at all, and had fear as the writings were copied by pressing against ancient tombstones. Emperor Wei Xiao Wen Di was the alien emperor that wanted to achieve interracial harmony. He moved the capital from Datong of Shanxi Province near the Mongolian border to Luoyang of Henan Province. This met great opposition from the high officials for fear of losing their Xian Bei cultural roots. Wei Xiao Wen Di instituted assimilation policies on all fronts to the Han culture, including the official language and marriage. To embed Buddha faces of Han race among the grotto sculptures. The cloud hill group of sculptures has many more Han faces because of Emperor Wei Xiao Wen Di's policies. The significance of this stone tablet is that it shows the transformation of the Chinese character fonts writing style, bridging the difference of the North and South, as the assimilation deepened it is getting closer to the Southern style. The natural boundary between North and South Dynasty is the Yangtze River. According to my intuition, Zhang Mong Long is a half-breed of Han and other races because his name is not native sounding. The Emperor has one quarter of Han, from his grandmother, who brought him up. This is like Qing Dynasty (1644-1911), their emperors eventually turned into Han people. The emperor also accredited to build the Shaoling temple which emphasized martial arts, physical fitness and exercise. The Zen has no books, it was brought to China during the Tang Dynasty. Zen was alien to China, and was brought into China by Indian royalty in exile. Buddhists came to China in 64 A.D., during the Eastern Han Dynasty. Buddhists assimilated into Chinese culture. Only Taoism is originally from China. There is a mysterious hanging temple on a cliff in Shanxi Datong Cloud Hill. There are many stories about who built it. Luoyang was the capital for Northern Wei of Northern Dynasty. Eventually Luoyang was burned to the ground. Fortunately before the fire an official secretly drew a map of the capital and diagrammed the architecture in name of honoring temples, so a historical record was kept. Many Northern Dynasty wood scrolls were discovered in the Dunhuang grotto in Gansu Province. Many went to the west region, and had a dramatic impact on European landscape as this caused the Xianbei and Turks to migrate to the west. Luoyang's Longmen grotto's main structure is of Han Empress Wu Zetian accompanied with visages of other races. This demonstrates that when Tang Dynasty took power, the Han people after almost 300 years submerged in dominance of other ethnic groups throughout the Northern Dynasty, finally came to the awareness of their original Han culture and identity, and revived Han facial images on sculptures and Han paintings. The alien emperor such as Wei Xiao Wen Di exerted great assimilation efforts in promoting interracial harmony and cultural exchange, and changed the terrain of the landscape. This made a very diversified civilization that the world should respect.